In the film Ready Player One there’s a scene where Wade Watts uses his in-game credits to have a real-world full-body haptic feedback suit delivered to his house. Throughout the movie we see OASIS’s developer James Halliday reject monetization ideas like in-game advertising and micro transactions. And yet, his company can afford to ship state-of-the-art VR suits to player’s houses for a few thousand credits. While OASIS credit may hold economic value for some companies, OASIS’s developer could give themselves an infinite supply of credits overnight. Meanwhile, manufacturing physical products is much more expensive. How hasn’t Gregarious Games gone bankrupt from sending out VR suits? 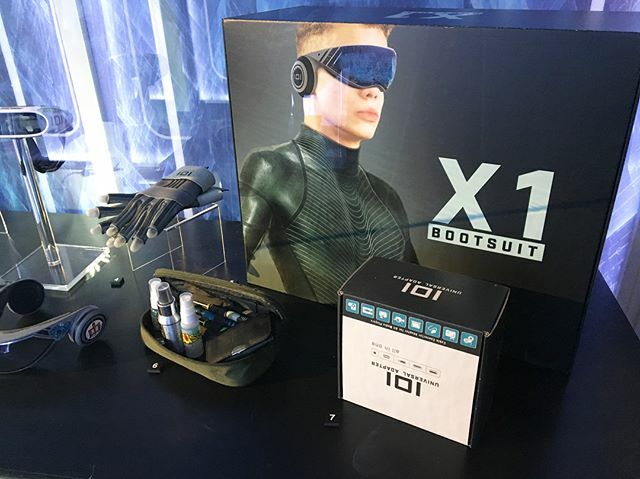 It looked to me as if the X-1 Haptic Bootsuit had the IOI logo on the box. So, it's actually IOI making and manufacturing them, but the OASIS is used as a marketplace. In the book, the same is done with pizza, with Wade saying that he could walk up to a counter, and a slice of pizza would be delivered to his door by his chosen food vendor. So, IOI is making the suits, and being paid 30,000 OASIS credits, which are used as a world currency. GSS just acts as a marketer, and, I assume, takes a cut of the profits. It wasn't free; he purchased the suit from a third-party vendor with OASIS credits. In the film the OASIS economy isn't really referenced at all. However, throughout the book you see different monetisation models used by Gregarious Simulation Systems aka Gregarious Games in the movie. Any business that wanted to setup shop inside the OASIS had to rent or purchase virtual real estate (which Morrow dubbed "surreal estate") from GSS. In addition to the billions of dollars that GSS raked in selling land that didn't exist, they made a killing selling virtual objects and vehicles. The OASIS became such an integral part of people's day-to-day social lives that users were more than willing to shell out real money to buy accessories for their avatars: clothing, furniture, houses, flying cars, magic swords and machine guns. These items nothing but ones and zeroes stored on the OASIS servers, but they were also status symbols. Most items only cost a few credits, but since they cost nothing for GSS to manufacture, it was all profit. The book goes on to mention that OASIS becomes a synonym for "internet" and you can start to extrapolate how much of the world's economy would be running through OASIS by looking at the world economy today. In the book, OASIS virtual credits are interchangeable with real-world currency, although there is no discussion about exchange rates and given the book was written prior to the rise of blockchain currencies like Bitcoin, it's reasonable that it's presented as a fait accompli. Also, I don't recall that he got the suit specifically from GSS. In the books there are multiple manufacturers and the first full immersion system he acquires is through a marketing deal. In fact the offers start rolling in once he gets the first key. I'd also received several endorsement-deal offers from companies who wanted to use Parzival's name and face to sell their services and products. An electronics retailer was interested in using my avatar to promote their line of OASIS immersion hardware so they could sell. "Parzival-approved" optic rigs, gloves and visors. In fact he received lots of offers for everything from toys to pizza companies. The OASIS credit is not really an in game credit. I am just going to try and take a stab at explaining this situation better than @Craig's answer. His answer is correct, but I do not think you are understanding the situation as he describes it. So the OASIS credit is not really an "in game currency" as you understand it. Remember, within the OASIS you live, work, play on multiple planets, platforms, situations, etc. The simulation is huge. Consider the OASIS at large like the Microsoft store at the hub of Xbox and all the things you can do within the OASIS (work, pvp, use internet, shop, etc.) as the games and apps you have installed on your console. Back in the day Microsoft used Points to pay for things on the console. You would pay $50 and it would be exchanged for 50MPs (50 Microsoft Points). Then you would use those points to pay for new games, character skins, etc. You didn't use those points in the games, but you could use them to purchase items or dlc for those games. Another way to think about it that might work better is Bitcoin. Hopefully you understand a little bit about cryptocurrency. Though Bitcoin is not widely used it is a currency that exists. If I convert all my money into Bitcoin, but a seller does not accept it that does not make my Bitcoin any less valuable, it just means I need to go somewhere else to use it. Kind of like how sometimes business do not accept certain credit cards, PayPal, or even foreign money. I can't pay with yen in a US Walmart. Does that mean any yen I have are worthless? No, just that I need to take it somewhere it is accepted. In the world of the RPO universe, the currencies of the nations of the world are not trustworthy due to wars, famines, corruption, etc. In addition, due to the popularity and success of the OASIS businesses have evolved to allow people to work from home (across the planet even) and shop online from their VR rigs. For a company not to go bankrupt, it merely has to have more cash money coming in than it has money going out. A company with a billion dollars in annual profit could give away a million dollars to a random person in the world every day and not go bankrupt. OASIS owns the equivalent of the internet in this reality. When you own the backbone of all commerce, you can make money through so many ways it isn't even funny. For an example, Craigslist started charging for apartment ads only in NYC in order to reduce the amount of spam. The resulting revenue stream paid for the entire rest of the website. Every other ad? Given away. It used real hardware and real people writing the software to host all of those other posts, but as money in > money out, no bankruptcy. The price of that suit in in-game currency can be set up to be such that people farming it wouldn't bankrupt the company. So that is easy. The next question is, why would they accept currency that they can create out of thin air? The US government has, in effect, the ability to create currency out of thin air; but it still accepts it for fees and services and to pay taxes. When you own the currency there are reasons to have sinks and sources for the currency to as a matter of monetary policy. Buying those suits is just a credit sink. Now, people are using OASYS currency to buy and sell real world goods. This does mean that the company who can print this currency can literally print money; if they do so without similar sinks, they run the risk of destabalizing the OASYS economy. There are probably a myriad of other "sinks" in the game for OASYS currency. If there are enough of them and enough demand for the currency, OASYS could literally pay all of its real world bills using OASYS currency. This would work amazingly well so long as the OASYS economy is growing exponentially, as the growth in the economy has to be aligned with a similar growth in currency to avoid painful and crippling deflation. Suppose OASYS currency manages an economy of GDP 1 trillion OASYS credits/year, and it has 10 billion credits in circulation (so a velocity of 100 credits/year). If it grows by 5% per year, the OASYS company has to bring into existence roughly 500 million OASYS credits every year to maintain stasis. Some of this comes into existence via in-game player action; other parts could literally be the OASYS company paying for their power bill in OASYS credits. When they take credits from someone they act as a sink -- so if they charge 1 million credits to rent some prime surreal estate, that decreases the credit supply by that much (and hence gives them that much more credits that they have to bring into existence somewhere else). A few VR suits is not going to be a problem. Especially if you have to be really really good at the game to earn the credits required. Not the answer you're looking for? Browse other questions tagged ready-player-one-2018 or ask your own question.